GENERAL LOCATION Southwestern corner of Washington County, slightly southeast of Colby Lake. MODERN ADDRESS 11256 Bailey Rd. in Woodbury. DISTRICT BOUNDARIES Colby Lake marks the northwestern corner; included the eastern half of Woodbury and the western tier of sections of Afton. 1858 or 1859: Schoolhouse built on a Mr. Brose’s farm, but only used one year. 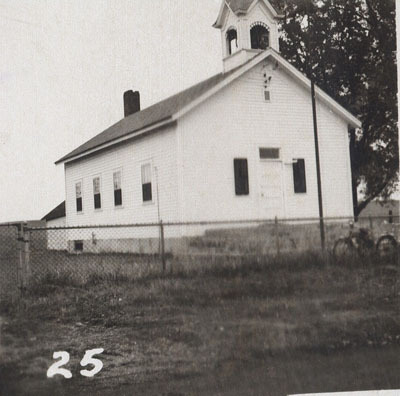 1860: New schoolhouse built, 40 by 22 ft.
1870: addition built to school. There were two terms. The winter term was from October or November through March or April. The Summer term was from May through July. The first school was private, and held in William Middleton’s house with Ms. Colby as teacher. The first public school was in John McHattie’s old log house and for 2 years taught by a Ms. Hunter. Electricity wasn’t installed until 1938. In 1898, there were 20 pupils from 1st to 8th grade. By 1939, there were 23 students. 17 students attended the school in 1952. Encouraged to consolidate with other area schools into District 102 (Newport – St. Paul Park) in 1952 to improve the quality of education. The school building was enlarged in 1870 and then stood 40 feet long by 22 feet wide. Joined the South Washington County School District in the 1950s, but was the last district to do so. Other teachers (before 1898): Mr. Rogers, Mr. Rice, Miss Vanslyke, Miss Seely, W. W. Hall, Miss Rufner, Miss Moss, T.P. James, Emily Crippen, Annie McHattie, Adda Ayres, Mary Borene. (after 1898): Elsie Peterson, Miss Bostoe, Miss Fleming, Mrs. Jensen, Mrs. Briggs, Mrs. Black, Lavina Bush, Clara Kernkamp, Mamie Feeley, Deela Johnson, Grace White.